Dimensions (approximate) 27 x 12 x 3"
* NOTE: Actual battery capacity specifications may vary in real-world conditions and are listed here as a base reference for a new module and are for comparison purposes only. 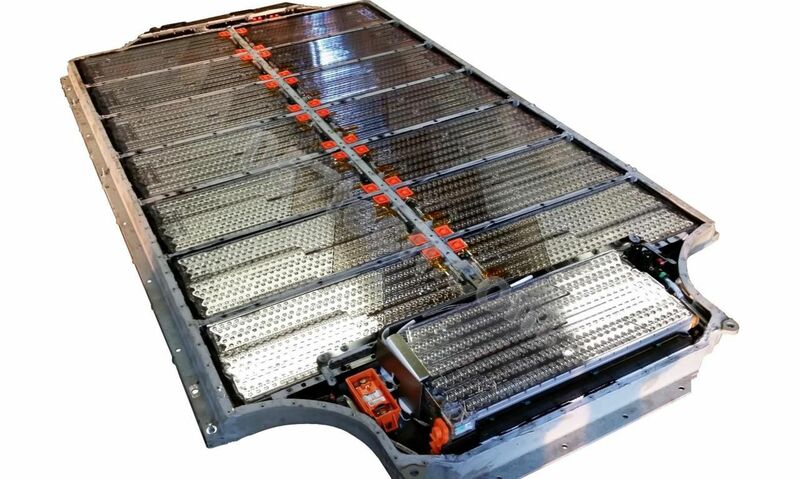 While HSR Motors strives to sell the best possible battery modules, the Tesla battery modules we acquire are used and actual capacities are not guaranteed. They may vary based on the actual age, usage patterns, cycles, etc. US Customers: Get a quick quote with shipping! Due to high demand, this product is currently a backorder item with an estimated lead time of three to four weeks. Our inventory is updated regularly and subject to change. Backorders are refundable until shipped. Shipping and discounts vary based on destination location and quantity. Please contact us to purchase this product! Note: Pricing is per module. Full battery pack and multi-module images shown above for illustrative purposes only. Tesla battery modules are an excellent choice for many different projects, such as EV conversions, backup power, solar power storage, RV power, off-grid setups, and more. The energy density of the Tesla battery modules are unmatched. The most popular, the 85-type, has an energy density of nearly 200Wh/kg! To see just how much space these modules can save compared to other types of batteries, check out 057 Technology founder's massive off-grid solar setup. What else do you have for these? Glad you asked! We offer all customers who purchase Tesla battery modules from us the option to have us swap out the proprietary Tesla cell sense board with our own custom converter board. Free of charge. This way you can easily use these modules with nearly any lithium ion balancing charger or BMS without having to deal with modifying the wiring to sense each cell. Don't settle for modified modules with butchered sense wires. Let us do the work the right way with our custom converter boards that breakout the large module into a single 6s XH balancing connector. Just let us know if you would like this option when ordering. If you're unsure, contact us and we'll help you decide if this is the right option for you. We also try to stock and offer the Tenergy 5-in-1 cell meter/balancer (as seen in the photo above) as an option at our cost of $15 to any customer who purchases our Tesla battery modules with our conversion boards. Why else should I buy these here? We have extensive experience with these battery modules. Our founder is well known in the Tesla communities and was the first to put these modules to use outside of a Tesla vehicle in his huge 44kW off-grid home solar project. We properly and safely extract them from Tesla vehicle battery packs, test them, and package them properly for shipping or pickup. When you purchase these from us you can be assured your purchase will reach you safely and quickly. These modules are also generally in-stock and can be shipped within one business day, unless otherwise specified. Some other vendors selling these modules claim to stock them, but instead will make you wait weeks or months to receive your order while they use your money to acquire them in the first place. Don't fall into that trap! While we do accept orders for these modules when we are out of stock and expecting more soon, we make this very clear before you order. We're not going to accept your order and then just wait for you to wonder where your purchase is weeks later. Some of our customers have come to us after a bad experience trying to source these modules elsewhere (eBay and the like). Sellers with shady tactics (including like explained above), combined with improper packaging, shipping without sufficient insurance, and many other pitfalls when dealing with other vendors. Suffice it to say, we have sold many hundreds of these modules to-date without any issues. Buy with confidence from a knowledgeable and trusted source!